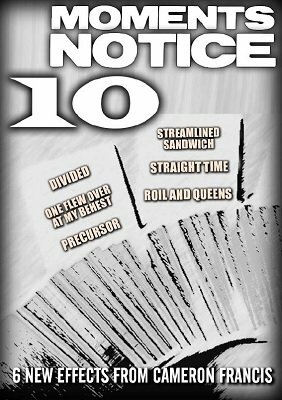 The Moment's Notice series continues with six more stunning, spectacular, sensational effects. Hard-hitting and easy to do, this might be the best of the series yet. Divided - An incredible two phase effect that ends in a full deck color separation (You are going to love the concept that makes this possible). Streamlined Sandwich - Two face up Jacks are cut into the deck. A card is freely selected (for real). It then appears between the two Jacks in the cleanest way possible. One Flew Over At My Behest - A quick, easy and very effective card across effect. Straight Time - A three phase effect that includes a highly visual Triumph. Precursor - A super commercial Ace Assembly. Roil and Queens - A commercial variation of the Hofzinser "Royal Marriages" plot. Wait, isn't that a contradiction in terms? Nope. Not this time! 1st edition 2016, 24 pages + YouTube links to video demos of all six effects.